Kenny wasn't there. Photo by War Dad Eagle, who was. Straight from Twitter. Watched the Auburn game with friends, and three delightfully distracting little girls who managed to turn the television off at one point. At least they were all short enough to walk under the screen and not get in the way of the shot. On the other hand we learned about chocolate chip cookie brownies, so the trade off might have been worth it. Florida and Georgia look like two emo kids trying to out emo each other. Maybe Georgia is the most emo. They are wearing the black trim. Hunker down and play Radiohead, unironically, Bulldogs. Ok, I’m at the football party. Let’s play ball. What do you mean it is already 7-7? Cam Newton the receiver? That’s just on-field Heisman marketing. TOUCHDOWN AUBURN! There is no scheme for Onterio McCalebb on that misdirection. Masoli to Summers for the score. The Auburn defense will get off the bus shortly. 14-14. @tzac81au is no fan of Faulkner. Though he does run rather like Sound and Fury. Cover this guy, cover that guy, there’s always Emory Blake. I love this. They haven’t had to show it, so the pre-season narrative has been diminished and then forgotten, but there are weapons and talent and the ability to produce all over the offensive side of the ball. We didn’t see that. Best not to see it. As I, and now others, have said: the only team stopping Auburn’s offense is Auburn’s offense. Fumbles will do it. This at a point where they’d produced a defensive stop and could have gone ahead by two scores and start the tidy business of putting this game away. Instead Ole Miss gets a reprieve. Demond Washinton with the goal line pick. So the drive in which we create separation continues again. I’m starting to warm up to this defense. I’d like to see Kodi Burns catch one in space, just to see him run again like his freshman year’s enthusiasm. Do you remember that? He’d dance around, gather a few yards, get tackled and then hop up like a kid so flush with energy he couldn’t vent it or express it all at once. It was beautiful. He should get a few more moments like that. Now this is offensive balance. Fill the box, Auburn will just throw it around the yard. Defensive coordinators are waking up in cold sweats now. Darvin dropped a pass. Does not compute. TOUCHDOWN AUBURN! Cameron Newton to Darvin Adams, showing a complete offense to the RebelBears. TOUCHDOWN AUBURN! Demond Washington! 95 yards! 31-17. Kickoff returns for touchdowns make one think we might get something resembling the illusive complete game. But Washington has been due a big return for weeks and Ole Miss is not very good at this. Stands to reason it would happen here. Ole Miss comes up short because Josh Bynes shows off his super powers. Now let’s see another score, just to rip out their hearts. The scoring defense isn’t there, but they show up when it matters and that is enough given everywhere else Auburn can produce. A touchdown would have been nice, but I’ll take a 17-point lead going into the half of a trap game. There is no Admiral Akbar. I just never saw the trap in this game. My sense of peace with it is now validated. And this is only halftime. Hey Ole Miss? Look away, look away, look away: Tigers are in town. One of the best songs a band plays. About four years ago, after Ole Miss lost at Jordan-Hare the two bands struck up a song simultaneously. 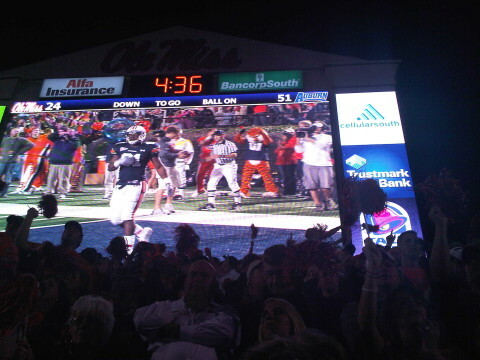 Auburn’s band stopped playing while the Rebel band finished this tune. It was late, dark, a little ethereal out. I’ve always liked that memory. His next update is “This is too easy.” RT @cameronnewton Cameron Newton can tweet during halftime. That’s a spoof Twitter account — I don’t write it, don’t know who does — and it is worth following. If you can hold a team to a four-yard gain, and feel good about it, you might be playing Auburn. And you’re in trouble. Because, really, you’ve limited Mike Dyer to half his average yards per carry. This guy just gets more impressive with each game. @wesbyrum stretches the Auburn lead to 20. 37-17. When ESPN calls your game and gets things wrong about your school you wonder how much they get wrong about other placed too. And, no, I don’t mean just Bob Davie. TOUCHDOWN AUBURN! Mike Dyer for 30 yards down the sideline. 44-17. He, too, is about to break a not insignificant Bo Jackson record. Eli Manning is looking to beat traffic put of Vaught Henmingway! Ole Miss scores, but this is all garbage time. 44-24. About the waning moments of the game, I feel for Mario Fannin having to fill that role, but I agree with the coaches that they’re going to need him to win. Fumble troubles notwithstanding, he’s a weapon receiving the ball out of the backfield. I hope he gets his chance to redeem himself before his career is done. Houston Nutt just showed up, Ole Miss recovers a surprise onside kick. @Lucas_au asked why Eli Manning would leave early, since Vaught-Hemmingway only seats 1,500 people. I replied: It takes a while. He can only drive his daddy. TOUCHDOWN AUBURN! @tzac81au with the score. If you were wondering, that’s hanging 51 points on an SEC team on the road. Fifty-one points! No matter if you say three-point road wins are good wins or that Auburn still has something to prove, you have to be impressed by this effort. The easy, obvious, natural comparison people try to make for this Auburn team is the 2004 vintage. I’ve asserted that you can be more confident about the general scoring power of the 2010 team on any given drive in any given game. Just for comparison, the 2004 Tigers, who could beat anyone like a drum by then, won 35-14 in Oxford. How about that offensive line? They need a award, too. There’s no doubt these guys, Mike Berry, Byron Isom, Ryan Pugh, Lee Ziemba, Brandon Mosley (and A.J. Green, before his injury) are the reason why. Nine and oh! War Eagle! In a year where Auburn sheds the ghost of 2004 we find ourselves cheering for USC. Weird. Thanks, Trojans. Undefeated, top of the charts and War Eagle!